Don’t be tricked by the exotic beauty of Phalaenopsis, they don’t require extraordinary care. Just follow these basic Phalaenopsis Orchid Care guidelines and your plant will bloom for years to come. Watering your Phalaenopsis is very important. Like all plants, if you forget to water it, it will die. 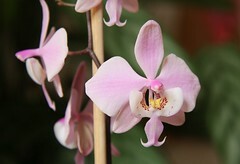 Moreover, these orchids lack a bulb to store moisture, so they are even more prone to dying if you forget to water them. Over watering these plants can also be very harmful. Too much water can cause fungal or bacterial rotting. Use pure water to water them, if you wouldn’t drink it, you probably shouldn’t give it to your plant. If you live in a region with hard water, never give your plant water that has been treated with water softening agents. Aim to use distilled water or water that has been purified by reverse osmosis. It’s best to water your plant in the morning, so that it has all day to dry out by the evening. Leaving water on your plant or letting your plant sit in a drip tray that is full of water is a bad idea. If you don’t get rid of excess water and especially if you let the roots of your plant sit in water it will eventually die. In general, your plant should be watered every four to seven days, but you should always keep an eye on the moisture levels of the potting soil. You never want it to become bone dry as this will shock the roots of your plant. But you definitely do not want it to be oversaturated with water either. Essentially, you should water again once the soil gets somewhat dry, but before it gets bone dry. The Phalaenopsis doesn’t require direct sunlight. In fact, direct sunlight can harm them. If you must place them by a window that gets direct sunlight, try placing a sheer curtain between the window and your plant to filter out a little light. Or just place your plant near a window that gets indirect sunlight. During the winter when light levels are lower, you might want to consider moving your plant to an area that gets a little more light. These types of orchids don’t like to get too cold. If you let them freeze, they will die. The ideal night time temperature for these plants is 62 degrees or higher, and the ideal day time temperature is between 70 and 80 degrees. Thus, these orchids make excellent house plants as these are likely the temperatures that you can find within your home. These plants lack a bulb to store water, so they prefer high humidity. The ideal humidity range is 50 to 70%. If you live in a dry area with low humidity, there are several things that you can do. First you could use a humidifier. Second you could keep your plant in the bathroom, showers serve to elevate the humidity level. Third, you can water your plant regularly. If they are watered regularly they can handle slightly lower humidity levels. Since orchids are grown by so many people, many fertilizer companies make fertilizer designed specifically for orchids. Just find a brand you like and follow the directions on the label. But in general, you will be fertilizing them with a liquid fertilizer about once per week when they are actively growing and about once every three weeks when they are not. If you are using a potting mix with a lot of bark, you may want to opt for a fertilizer with slightly higher levels of nitrogen. Under ideal conditions, these lovely flowers can bloom up to three times a year once they are fully grown. When they bloom, their blossoms can last for several months. If you would like to induce a higher blooming frequency, clip the flowers stem as soon as the flowers start to fade. You could leave them on until the flowers wilt and completely die, but trimming them as soon as they start to fade will induce the next flower spike to develop sooner. If the flower buds on your plant die before blooming, then you might want to check if any of the following factors are present: high temperatures, excessively low lighting, too much or too little water, watering with soft water, over-fertilization or excessive cold. You could buy bark and moss and various other materials and create your own potting mix, but unless you are a dedicated orchid grower, this is probably not worth the effort. I would recommend that you simply buy a commercial orchid potting mix and be done with it. Remember to repot your plant once per year as the potting mix breaks down after a while. Try to repot during a colder time of the year, like fall or spring, when your plant isn’t flowering.